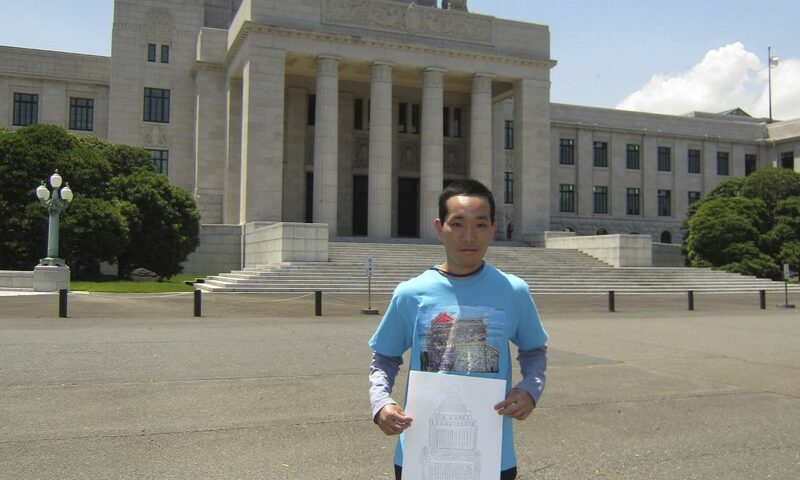 Artist Kengo Nawashiro, 26, loves drawing buildings and towers. His beautifully colored paintings of the Tokyo Skytree are printed on postcards and sold at art events. Nawashiro credits his success to renowned art educator Chieko Awata, who is a specialist in nurturing the talents of autistic children and adults. 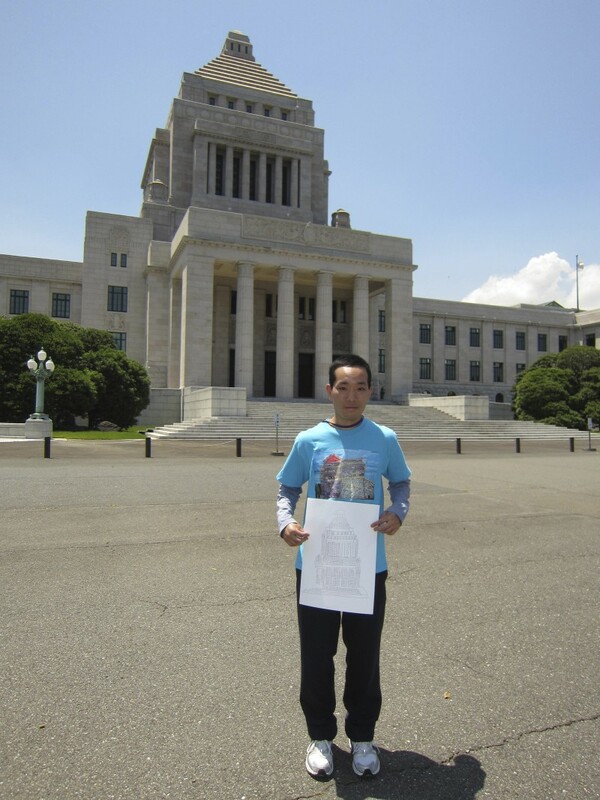 Nawashiro was diagnosed with autism at age 4, and his parents immediately began looking for creative outlets for him. He played the piano and tried various sports, but it was drawing that proved to be Kengo’s favorite activity and definite forte. Being independent feels nice because I’m free, and my parents and teachers are happy too. I was 24 when I moved out from my parents’ house into a group home. There are four other boys there and a care manager, but I don’t see them often as I’m always out and about. It’s very lucky if one’s workplace is far from one’s house. This way going to work is as fun as being at work. I use many forms of transportation to go to the factory: I walk, take a city bus, then transfer to a train that takes me to another prefecture. Finally I hop on a company bus. After work I take the same route again, backward. All my friends love trains and buses, but not everyone can ride alone. Getting everything clean is the best job. I really enjoy my work. Since I graduated high school, I have been working full-time in a cafeteria. I love washing the dishes and wiping the tables. I also like lining up the plates. We put food on the table for 1,400 people, so we have a lot to clean and arrange. The most fun is when I tie the garbage bags and take them outside. I wish workdays were longer. My day goes by so fast that I feel like I’ve just arrived at the factory when I’m supposed to go home. I could work longer, but I’m told that working seven hours is normal for people. If autistic people look and behave like others, they may be misunderstood. My friend is like other boys but he has autism. Others don’t know that, so they wonder why he can’t manage certain things. My way of speaking is different from most people, so everyone knows I’m different. Finding and using other people’s talent is the greatest talent. Many of my friends have an imprint of the train lines in their heads. I do also. We can cite every station in Tokyo and many in Japan. We love the trains. Cleaning them would be so much fun! I think more autistic people could work for train companies. Drawing tall things is the biggest thrill. I often draw the Tokyo Skytree, as I can see it from my window. It’s very tall: 634 meters. I look up to it. Before the Tokyo Skytree was built, I used to draw Mount Fuji. Which is bigger? The one I see closer! The Tokyo Skytree looks much bigger than Mount Fuji. Always act so your parents, teachers and friends do not worry about you. Every day I send a lot of emails from my mobile phone to my mom, dad, teacher and friends. “Good morning! Now I’m leaving my apartment.” From the train I write: “I’m at so-and-so station. It is 6:54. I passed the station at 6:56,” etc. So everyone knows where I am and what I’m doing. But I never use my phone at work. Getting a job is hard but keeping it is more difficult, as we need to listen and make constant effort. I enjoy working hard and sticking to a schedule suits me well. One must prepare for the death of one’s parents. On weekends I’m at my parents’ house, organizing my belongings. I have a lot of stuff and I must make it more compact, because one day my parents will die, which means I will have to move everything to the group home. I only have one room to fit all my things into. I have many photos, which I am digitizing so they take up less space. It’s important to know when to leave people alone. My mom waits until I can do something. It usually takes a long time, but I once I’ve learned it, I don’t forget it. Art can give people a chance to think of politics. My art class had a tour of the Japanese Diet building, and we drew the facade. We heard that there were 5 million challenged people in Japan. We’re allowed to vote, but when I’m not sure who to vote for, my mom gives me hints. We look for politicians who care about and pay attention to challenged people. We all have capabilities, but sometimes we need our parents and teachers to be patient enough with us to bring out our talents. I had to practice the jump rope for two years until I could do a double skip. Once I did it, I realized that if I made an effort I could do anything. I think anybody can achieve what they would like to do, even though it might take years.